Antoniades, et al have a paper, No Free Shop. There have always been two sides to the g0-shop issue. On the one side, if a company has the right to proactively shop itself post-signing, that should be good, right? In Topps, Chief Justice Strine called the go-shop "sucker's insurance". Generally, employing a go-shop provision is one of several ways that a board can, in good faith, reassure itself that it has received the highest price reasonably available in a sale of control. On the other hand, when one looks at the way go-shops are actually deployed, one wonders what is going on. By now, they are regularly included in merger agreements with private equity buyers and rarely included in merger agreements with strategic buyers. If you believe that private equity buyers have characteristics of a common value buyers and strategic buyers are more like private value buyers, then the go-shop takes on a different, less appealing light. Abstract: We study the decisions by targets in private equity and MBO transactions whether to actively 'shop' executed merger agreements prior to shareholder approval. Specifically, targets can negotiate for a 'go-shop' clause, which permits the solicitation of offers from other would-be acquirors during the 'go-shop' window and, in certain circumstances, lowers the termination fee paid by the target in the event of a competing bid. We find that the decision to retain the option to shop is predicted by various firm attributes, including larger size, more fragmented ownership, and various characteristics of the firms’ legal advisory team and procedures. We find that go-shops are not a free option; they result in a lower initial acquisition premium and that reduction is not offset by gains associated with new competing offers. The over-use of go-shops reflects excessive concerns about litigation risks, possibly resulting from lawyers' conflicts of interest in advising targets. Guhan Subramanian's 2007 Business Lawyer paper, Go-Shops v No-Shops, came to a different conclusion with respect to the utility of go-shops. So, this issues gets debated back and forth quite bit. On the one side are those that argue that LBOs are good corporate governance. The presence of debt and the high degree of equity ownership by managers pushes managers to improve efficiency and profitability of the firm in order to quickly pay down that debt. In that way, the LBO structures reduces the agency problems that plague the public corporation. On the hand there are arguments that the LBO is nothing more than financial mumbo-jumbo that does little more than create opportunities for managers to enrich themselves. This study uses corporate tax return data to examine the evolution of firms' financial structure and performance after leveraged buyouts for a comprehensive sample of 317 LBOs taking place between 1995 and 2007. We find little evidence of operating improvements subsequent to an LBO, although consistent with prior studies, we do observe operating improvements in the set of LBO firms that have public financial statements. We also find that firms do not reduce leverage after LBOs, even if they generate excess cash flow. Our results suggest that effecting a sustained change in capital structure is a conscious objective of the LBO structure. One of the great strengths of our country is that we abide by the rule of law. However, state laws dealing with corporate governance often favor incumbent corporate boards and management and are weak in many areas. While we must abide by these laws, we believe that they can and must be changed. Among many other things, boards should not be able to treat elections as totalitarian dictatorships do; where if they lose, they simply ignore the results. Well...okay then. What happened to the appraisal threat? I guess that's not going to happen, either? The survey covers 40 sponsor-backed going private transactions with a transaction value (i.e., enterprise value) of at least $100 million announced during calendar 2012. Twenty-four of the transactions involved a target company in the United States, 10 involved a target company in Europe, and 6 involved a target company in Asia-Pacific. The number and size of sponsor-backed going private transactions were each lower in 2012 than in 2011 and 2010; . . . . Specific performance "lite" has become the predominant market remedy with respect to allocating financing failure and closing risk . . . . Specific performance lite means that the target is only entitled to specific performance to cause the sponsor to fund its equity commitment and close the transaction in the event that all of the closing conditions are satisfied, the target is ready, willing, and able to close the transaction, and the debt financing is available. Reverse termination fees appeared in all debt-financed going private transactions in 2012, . . .with reverse termination fees of roughly double the company termination fee becoming the norm.
. . . no sponsor-backed going private transaction in 2012 contained a financing out (i.e., a provision that allows the buyer to get out of the deal without the payment of a fee or other recourse in the event debt financing is unavailable). Some of the financial-crisis-driven provisions, such as the sponsors’ express contractual requirement to sue their lenders upon a financing failure, have diminished in frequency. However, the majority of deals are silent on this, and such agreements may require the acquiror to use its reasonable best efforts to enforce its rights under the debt commitment letter, which could include suing a lender. Go-shops remain a common (albeit not predominant) feature in going private transactions, and are starting to become more specifically tailored to particular deal circumstances. Tender offers continue to be used in a minority of going private transactions as a way for targets to shorten the time period between signing and closing. Acording to Dan Primack at Fortune, Dell's independent directors agreed to reimburse Blackstone the cost of its bid as part of the go-shop process. This is a real positive, and I am surprised that more sellers with go-shop provisions don't do this as a matter of course. With an incumbent bidder in place, there are real disincentives for a second bidder to make the transaction specific investments required to put together a competing bid. By agreeing to reimburse second bidders if they enter into a go-shop process, the independent directors lower the bars to generating second bids and increase the likelihood that the go-shop will be more than just window dressing. That's a good thing. Smart counsel for independent directors will be looking at Dell and fighting hard for reimbursement provisions in future deals. the consequences of such a termination. Dennis Berman at the WSJ has a piece at WSJ.com that asks the right question about the now simmering Dell going private transaction. Who is Dell working for? Management buyouts are always fraught, precisely for this reason. Prodded by court rulings, boards have taken steps to minimize the most flagrant problems. Should a deal be announced, be prepared for a barrage of reminders about "independent committees," "go shops" and the like. But these steps are ultimately cosmetic. No one will say it this way, but it's the way deals happen: The conflict is the opportunity. For example, without Mr. Dell's stake, it would be nearly impossible to assemble the $22 billion to $25 billion needed to buy the company. It's also unlikely that another buyout shop or industry player would make a competing bid without Mr. Dell's consent. In these situations, a powerful executive like Mr. Dell can effectively act as his own poison pill, guarding against outcomes he doesn't like. Make no mistake. Once this deal is announced there will be multiple suits. So of course, the lawyers are being attentive to the requirements. But if the J Crew transaction from last year is any guide the deal will pasts muster. However, these going private transactions always raise a question with me. If Dell (or whoever is the continuing management) have such good ideas about how to run the company, why don't they just go ahead and implement them now for the public shareholders? Why keep all the good ideas and strong management for when the business goes private? It's a question without a real answer. Here, the Don't-Ask-Don't-Waive Standstills block at least a handful of once-interested parties from informing the Board of their willingness to bid (including indirectly by asking a third party, such as an investment bank, to do so on their behalf), and the No Solicitation Provision blocks the Board from inquiring further into those parties' interest. Thus, Plaintiffs have at least a colorable argument that these constraints collectively operate to ensure an informational vacuum. Moreover, the increased risk that the Board would outright lack adequate information arguably emasculates whatever protections the No Solicitation Provision's fiduciary out otherwise could have provided. Once resigned to a measure of willful blindness, the Board would lack the information to determine whether continued compliance with the Merger Agreement would violate its fiduciary duty to consider superior offers. Contracting into such a state conceivably could constitute a breach of fiduciary duty. Bidders aren't allowed to bid and sellers aren't allowed to ask. To the extent previous Chancery Court rulings have ruled that boards violate their duties to the corporation by engaging in willful blindness, Don't-Ask Don't Waive provisions in standstills do raise legitimate issues. Chancellor Strine recognized these potential problems on Monday when he considered the same provision in the Ancestry.com Shareholder Litigation. He noted a couple of important things. First, these provisions are not per se illegal. There are uses of don't ask-don't waive that are consistent with a director's fiduciary duties under Revlon. For example, in designing an auction process, directors might want to design credible rules that will generate incentives for bidders to put their best bids on the table right away and thereby avoid potentially lengthy serial negotiations down the road. The don't ask-don't waive provision signals to bidders (credibly, if it's enforceable) that they get only one shot at the apple. On the other hand, such provisions as Strine noted, can be used by boards in a way that is inconsistent with their fiduciary duties. If directors lean on such provisions to close their eyes to a materially higher subsequent bid, they may be violating their duties to remained informed in the manner that Vice Chancellor Parsons was worried about in Celera. In this case, the board had disclosed to shareholders - who are supposed to vote on December 27 - that the board could terminate the transaction in the event it received a superior proposal. The board did not disclose to shareholders that the most likely topping bidders were all boxed out by don't ask-don't waive provisions in the standstill agreement. Strine ordered additional disclosures prior to the planned shareholder meeting, sidestepping for the timebeing the question of the don't ask-don't waive provision. I understand what he's trying to accomplish. On the one hand, shareholders need to know that there isn't effective competition for the seller because of the provision that leaves out the most likely bidders. On the other hand, if shareholders miss the Dec 27 window, then "fiscal cliff" implications may leave shareholders holding a much bigger tax bill. Damned if you do, damned if you don't so to speak. So, he let it proceed and left it to shareholders with all the information in their hands, to decide whether or not to accept the offer on the table. The typical M&A confidentiality agreement contains a standstill provision, which among other things, prohibits the potential bidder from publicly or privately requesting that the target company waive the terms of the standstill. The provision is designed to reduce the possibility that the bidder will be able to put the target "in play" and bypass the terms and spirit of the standstill agreement. In this client alert, Gibson Dunn discusses a November 27, 2012 bench ruling issued by Vice Chancellor Travis Laster of the Delaware Chancery Court that enjoined the enforcement of a "Don't Ask, Don't Waive" provision in a standstill agreement, at least to the extent the clause prohibits private waiver requests. until further guidance is given by the Delaware courts, targets entering into a merger agreement should consider the potential effects of any pre-existing Don't Ask, Don't Waive standstill agreements with other parties . . .. We note in particular that the ruling does not appear to invalidate per se all Don't Ask, Don't Waive standstills, as the opinion only questions their enforceability where a sale agreement with another party has been announced and the target has an obligation to consider competing offers. In addition, the Court expressly acknowledged the permissibility of a provision restricting a bidder from making a public request of a standstill waiver. Therefore, we expect that target boards will continue to seek some variation of Don't Ask, Don't Waive standstills. Haynes and Boone has a short summary of the pros and cons of each here. Weil, Gotshal has just released its fifth annual survey of sponsor-backed going private transactions, analyzing and summarizing the material transaction terms of going private transactions involving a private equity sponsor in the United States, Europe and Asia-Pacific. Have a look. In Delaware, the buyer is not precluded from recovery based on pre-closing knowledge of the breach because reliance is not an element of a breach of contract claim. The same is true for Massachusetts and, effectively, Illinois (where knowledge is relevant only when the existence of the warranty is in dispute). But in California, the buyer is precluded from recovery because reliance is an element of a breach of warranty claim, and in turn, the buyer must have believed the warranty to be true. New York is less straightforward: reliance is an element of a breach of contract claim, but the buyer does not need to show that it believed the truth of the representation if the court believes the express warranties at issue were bargained-for contractual terms. In New York, it depends on how and when the buyer came to have knowledge of the breach. If the buyer learned of facts constituting a breach from the seller, the claim is precluded, but the buyer will not be precluded from recovery where the facts were learned by the buyer from a third party (other than an agent of the seller) or the facts were common knowledge. Given the mixed bag of legal precedent and little published law on the subject, if parties want to ensure a particular outcome, they should be explicit. When the contract is explicit, courts in California, Delaware, Massachusetts and New York have either enforced such provisions or suggested that they would. Presumably Illinois courts would enforce them as well, but there is very little or no case law to rely upon. Axelson et al have a recent paper, Borrow Cheap, Buy High? The Determinants of Leverage and Pricing in Buyouts, that provides cross-sectional review of LBO structures. The paper reinforces the notion that cheap and readily available credit is the mother's milk of the LBO boom. Abstract: This paper provides an empirical analysis of the financial structure of large buyouts. We collect detailed information on the financing of 1157 worldwide private equity deals from 1980 to 2008. 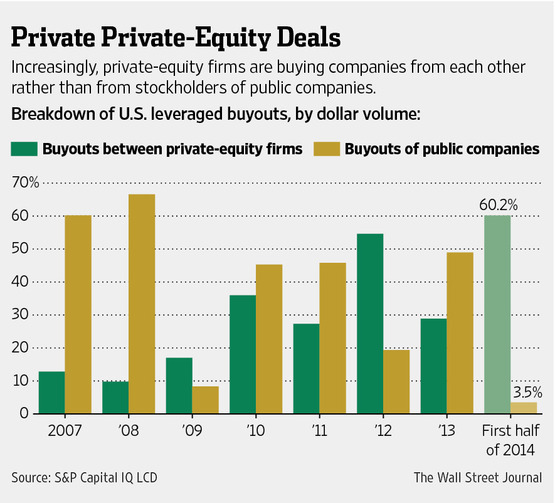 Buyout leverage is cross-sectionally unrelated to the leverage of matched public firms, and is largely driven by factors other than what explains leverage in public firms. In particular, the economy-wide cost of borrowing is the main driver of both the quantity and the composition of debt in these buyouts. Credit conditions also have a strong effect on prices paid in buyouts, even after controlling for prices of equivalent public market companies. Finally, the use of high leverage in transactions negatively affects fund performance, controlling for fund vintage and other relevant characteristics. The results are consistent with the view that the availability of financing impacts booms and busts in the private equity market, and that agency problems between private equity funds and their investors can affect buyout capital structures. (ii) conditioned on a majority-of-the-minority tender or vote.